I’m not really a big bagnet fan (*gasp*). The typical specimens served are usually so dry and hard they can break a tooth filling. And the frying oil used is more often than not rancid. Not good. But when our recent Table Guest Jericson Co shares a food tip, one takes action. So I headed out to try the bagnet served at Manong’s Bagnet Station (with it’s byline “Bagnet at it’s Best”). It’s tucked away in a corner off Tomas Morato and I’m assuming this restaurant also serves as their commissary. Manong’s has been and still maintains presence in a few weekend/night markets across the Metro. In a nutshell, they do their byline justice. It is pork perfected. Whole pork bellies are, I infer, cooked confit style. Simmered low and slow in pork fat till it becomes tender. It is then fried in higher heat to produce an extremely crunchy outer layer. It’ll make you weep a little bit. And surprisingly it’s not so much the crispiness of the skin but the succulent, luscious tenderness of the insides that’ll kill you. It is so so sinfully good. There is that strong pork flavor than not only comes from the meat but also from the lard used. Clean porcine flavor. I had tried their bagnet meal which comes with rice and a side of salted egg and a relish of diced tomatoes and onions. Quite inexpensive at P135. In a next visit I had ordered the Bicol Express, what I thought to be a vegetable dish, just to temper the guilt. What I was expecting was a something with mostly vegetables and chilli with a little pork. 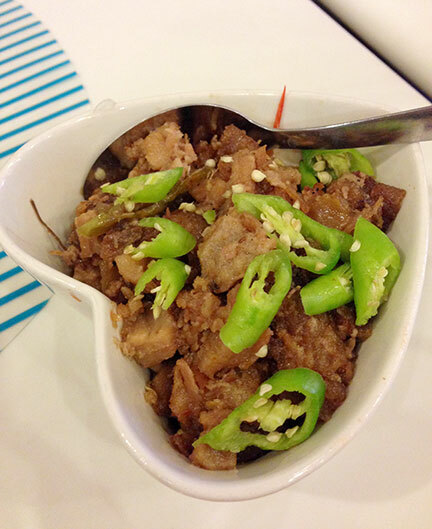 What I got was a dish made entirely of bagnet bits, stewed in coconut milk and topped with some chilies. It was delicious though. 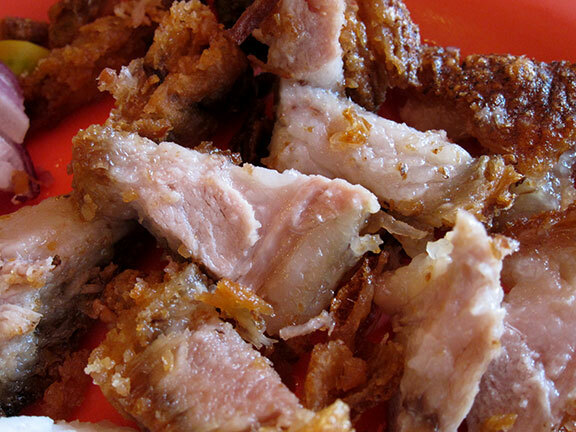 The coconut milk completely infuses with the bagnet meat and you get a bit of spice. Again, killer. 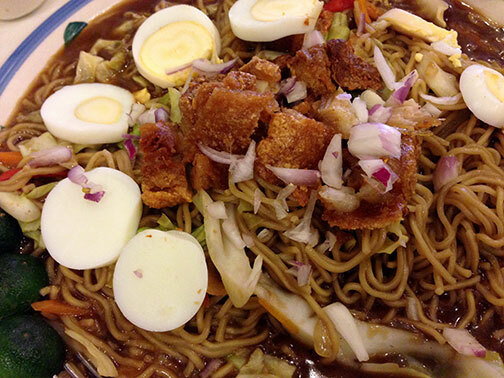 I had also tried the Pancit Cabagan, thickish egg noodles in a heavy gravy topped with more bagnet. A serving is huge, though, and is meant to be shared with at least four people. I have to admit it’s not quite my favorite. However, there are a few other interesting items on the menu to be sampled on the next visits. 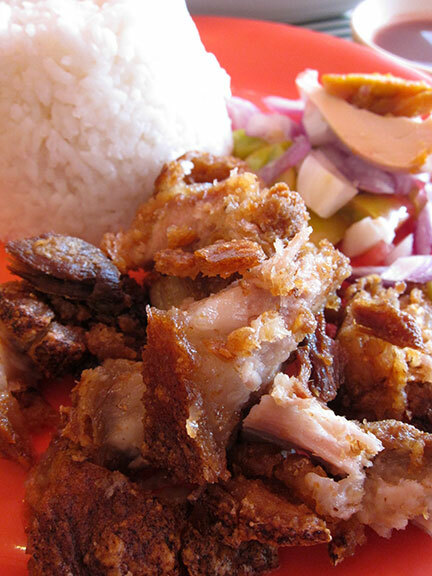 If you’ve never tried this place, then go for the straight up bagnet. It’s something else. 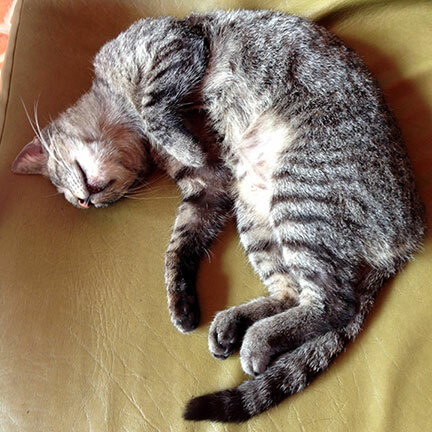 So rich and fatty that a meal here will make you want to curl up in a fetal position afterwards… much like this cat that hangs out just outside Manong’s door. Dead to the world. *Manong’s also sells frozen bagnet by the kilo for take-aways or “gifts”.